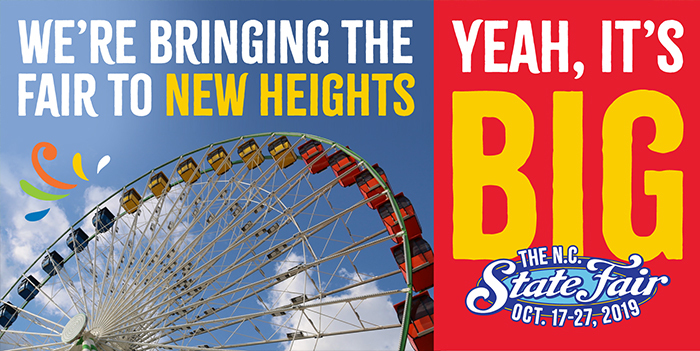 At 155 feet, the tallest mobile Ferris wheel in North America is coming to the N.C. State Fair in October! The new Ferris wheel towers 62 feet over Dorton Arena and will sit between the historic arena and Hillsborough St. with a panoramic view of over 15 miles. Tickets are $6 in advance or $7 once the Fair begins. This attraction will not be included in the list of rides eligible for the unlimited ride wristband. Click through to offer your idea on what this iconic attraction should be named! The N.C. State Fair is now accepting applications for vendors and suppliers. Download the vendor instructions and application here. Download the supplier instructions and application here. With over 500 events year-round, we've got just what you're looking for!